In December 2016, the fire service of Zone Val de Sambre celebrated the official opening of its new fire station in Sambreville, Belgium. It was the culmination of a 10 year and €6.7 million project. The new fire station has a large hall of 2400 m2 for the engines and vehicles, 2700 m2 of office space including the dispatch centre, a crisis control room and meeting rooms, along with a gym, a catering area and other facilities for the firefighters. The station houses 128 professional and voluntary firefighters, 22 ambulance personnel, 21 higher officers, 29 sub officers, 6 officers and 6 administrative employees. The fire station serves six municipalities with a total population of 88,000. Every year, 2,500 fire interventions and 4,000 ambulance interventions are carried out. The location of the new building was a strategic choice, near estates that accommodate companies in the chemical industry such as Solvay. Moreover, the new fire station is located next to the training centre for the fire brigades of the province of Namur. This enables the Zone Val de Sambre station and the training centre to contribute to, as well as benefit from each other. It was not enough to improve training. Local municipalities and Fire Service leadership also wanted to reduce emergency response time, better maintain equipment and offer more comfort to personnel. “Here we have a building that combines operational, administrative, technical and logistic services. This means that the heating system had to be equally flexible,” says Marc Gailly, Sales Agent for Belgian Reznor distributor Molimex-therm. “The firefighters need a convenient place to work in, cook their meals, stay in shape and have a shower. The ambulance area and garage must be comfortable and the main hall required a minimum temperature of 5°C”. Therefore, Molimex-therm, together with contractor Techniterm, had to supply a flexible and efficient solution, more specifically high efficiency heating for large spaces. Reznor’s gas fired unit heaters combined with destratification fans proved to be the perfect solution for large spaces. In the main hall, Techniterm installed three Reznor RHeco 50 gas fired unit heaters. Two RHeco 25 unit heaters were foreseen for the ambulance area and garage. Reznor’s high efficiency RHeco is a unit heater with the lowest NOX and CO2-emissions on the market today: under 25 ppm; NOX class 5. These fully condensing gas fired heaters have a thermal efficiency of 109% NCV at partial load and 100% at full load. In conventional unit heaters, some of the energy from the combusted gas and air mixture is lost in the flue gases that are vented outdoors. In the RHeco however, these flue gases are led through a secondary heat exchanger, in which the flue gases condense to below the dew point. When water vapour, which naturally occurs in flue gases, condenses, its latent heat will also be transferred to the heat exchanger and thereby to the air flow from the unit heater. Hence, less energy is needed to heat up the space. 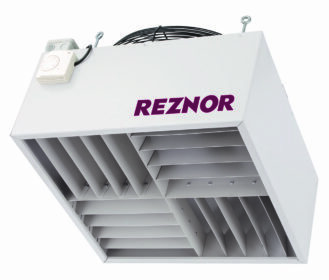 To further improve the efficiency of the warm air heating system, six Reznor destratification fans push risen warm air from the space under the roof back to the ground level. By recirculating air, temperature gradients are reduced. With destratification fans, energy loss through the roof is avoided, and warm-up time will be significantly reduced.